Hey, what's up my name is Cameron Knight! I'm a fulltime freelance artist & illustrator. Like most fulltime artist I'm usually juggling a ton of commissions and client work, while also trying to find time to work on my own personal projects. 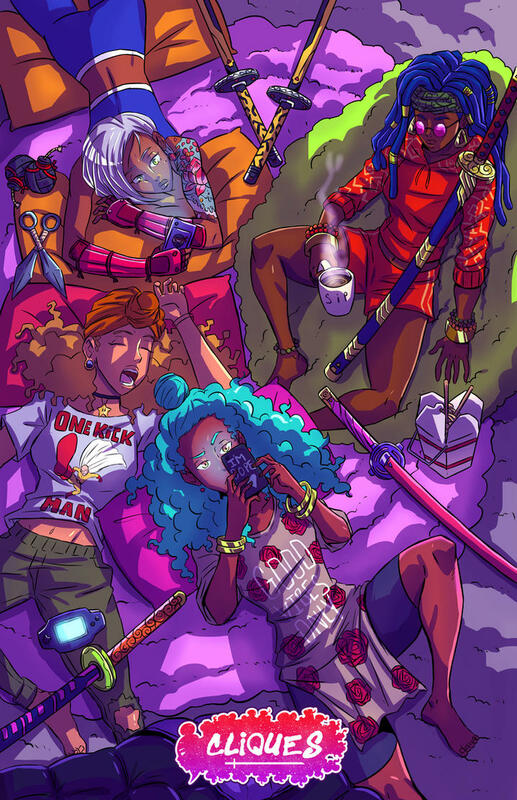 One of those projects being my comic called Cliques, which follows four best friends as they navigate through their daily lives in a city where 90% of the population use weapons called Saber edges. I quit my job a few years back to make my passion for art and creating stories and characters into a career and starting my own comic was a big goal for me. My next goal is to be able to continue to work on Cliques and give it a lot more time. By supporting my patreon you can help accomplish that goal. Any amount is truly appreciated and will help me develop some dope exclusive content for you guys! Thank you for taking the time to read this! and hope you enjoy my comic!! This was would be crazy! If I can hit this goal I will definitely update cliques with more pages weekly and this will also help with getting Cliques Chapter 1 printed and also allow more time for me to create exclusive content for you all.